33' to Alaska: Thursday, July 9, Ripple Cove, Glacier Bay – Salmon, Finally! 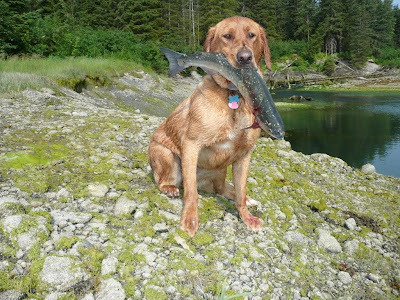 Thursday, July 9, Ripple Cove, Glacier Bay – Salmon, Finally! Yesterday, we spent most of the afternoon at Glacier Bay National Park Lodge. Val did laundry, the boys washed the boat, and I took care of e-mails and voice mails. We love the lodge and they have great food on a lovely deck with a killer view. We fueled up, filled with water and headed back to Berg Bay for the night. We found a cool little cove with a creek that dumped into it. It looked like bear territory. The water was mirror smooth and the mountains were perfectly reflected. We were all full from our late lunch so we had our devotions and played poker…the little gnats were too bad to be outside. Turns out to be a good thing…I won the poker game! We all slept great. I got up at 7:30 and took the dogs for an exploratory dinghy ride. We saw the salmon jumping all over so I went back to the boat, grabbed my gear, and went back out. Finally, I got two sockeyes and one pink. I didn’t have my rule book so went back to the boat to check sizes and properly identify them. Then everyone got excited and wanted to go. We read the book and found out everything was legal…yeeha! We got salmon! Off we go to catch some more. Two more salmon later and we’re back on the boat enjoying fresh baked bread and wild rice soup. Yum. I cleaned the fish, vacuum packed them and stowed them in the freezer. Well, our permit in Glacier Bay expires today so we’re heading out, stopping to do some halibut fishing along the way. The boys got their lines out and I think Connor’s getting bites, so I better get ready to help him.